5 Reasons To Get Custom Made Security Doors For Your Home! When you hear the word security, what comes to mind? You probably don’t think of design or visual appeal. Instead, you probably think of thick bars, heavy metal and a slightly sinister appearance. But that’s about to change! Security doesn’t have to mean thick bars and a prison-like ambience. With the right wrought iron expert, security can mean so much more. And that’s good news because security is important! Security doors are your first line of defence against theft and home invasion. But it’s about even more than that alone. Security doors give you the peace of mind that comes with knowing your home, and everyone in it is protected. Still not convinced? Well, we might be able to change that. Having worked with custom iron installations for so long, we know what they have to offer. More importantly, we know just how much you can get out of custom made security doors. That is why we have listed these five reasons to get custom made security doors for your home. And, believe it or not, these are just a few of the many reasons why custom-made security doors are right for you! #1 Custom made security doors offer more than just security! Custom made security doors and security are synonymous. But what about custom made security doors and design? It is a little known fact that, with the right help, security installations can have a decorative effect. And here’s the best part: custom making your own security doors means you take the lead. You can experiment, visualise, conceptualise and be a part of your own security creation. Wrought iron security doors are particularly popular for that exact reason! Wrought iron is malleable, durable and it has a timeless elegance that simply cannot be emulated. Sure, the market is full of security doors. But how many of them are truly unique? In fact, how many homes have permanent fixtures that are one of kind? Not many! With custom made security doors, you can create something that is as artistic as it is practical. So why pass up such an opportunity? #2 Want the highest standard of security? Get custom made security doors! Now for the obvious benefit of custom made security doors: security. It goes without saying that custom-made security doors offer you great security. But how does their security differ to that of generic security doors? Well, there are many reasons. Custom made security doors are made for your home specifically. Unlike generic versions, they are built to be fitted in one place, and one place alone. This means that they do not compromise on security at all. Custom-made security doors will be the perfect size, the perfect shape, and they will come with the perfect mounting option. The result: impenetrable security! Custom-made security doors have such a presence that they act as a deterrent too! So not only do they look great and offer excellent protection, but they also discourage would-be thieves and trespassers from even trying! Have you driven past a particularly old building lately – perhaps an old church or school? If you have, you may have noticed the one thing that stands out the most: the gate. And in most old buildings, what is the gate made from? Wrought iron! Iron is one of the most durable materials used in the construction of security doors. And the same is true of custom made security doors! There are many reasons for this, including that iron is malleable and can be twisted into stunning shapes. But one of the foremost reasons is durability. Even after a lifetime exposed to the elements, wrought iron gates can be restored to perfect condition with ease. And custom made security doors are no different! Your custom made iron security door will stand the test of time like no other. The quality of its custom design will equip it for a lifetime of standing guard over your home. So invest in the future and get a custom made security door – you’ll probably only need to do so once! #4 Want your security door to match your windows? Custom made security doors are the way to go! Have you already got security fittings on your windows? Are you quite fond of their design and appearance? If so, why compromise on a security door? If you know what you want, then take it! Get a custom made security door designed specifically for your purposes. This approach to security doors is great for homeowners who like their security fittings to match. A corresponding set of security solutions is a great design tool. 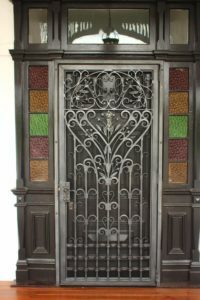 And you can really tie them all together with the centrepiece: a beautifully handcrafted, custom made security door! Better yet, your security will be at the highest standard possible. With uniformed security doors and windows, your home will be protected better than ever before. The likelihood of anyone even trying to past them is minuscule. And the likelihood of anyone actually getting in is even smaller! So we have looked at some of the bigger picture benefits of custom made security doors. And there are a lot! But it isn’t all about the large and obvious benefits. Custom made security doors offer an abundance of day-to-day advantages that you often don’t think of until you experience them. One of the best such advantages is making the most of that natural breeze! In a place like Brisbane, where summers are hot and humid, it is all too easy to rely on the air conditioner. But that can be expensive. A better bet is to find a more natural solution, and what better solution than the breeze? With a custom made security door, you can leave your front door open and let that summer breeze roll through. You can enjoy this day or night, safe in the knowledge that your security door is standing guard! For all your wrought iron security door needs, get in touch with the experts at Dean-Wilson Iron on 3814 0076.